We are entering the peak of the 2017 Atlantic Hurricane Season and there are several items of interest in the Atlantic Tropics as we get close to the peak of the season. We will go through those items now. There is yet another area of disturbed weather producing disorganized showers and thunderstorms located a few hundred miles southwest of Cabo Verde Islands and associated with a tropical wave. This system has potential in the 2-5 day period as it moves westward. It has near 0 percent chance of development within 48 hours but a medium chance, 60%, for development within 5 days. The VoIP Hurricane Net Management Team will closely monitor the progress of this system. You can find the Tropical Weather Outlook off the main menu of the voipwxnet web site, via the voipwxnet Facebook/Twitter feeds and at the NHC web site at http://www.nhc.noaa.gov as well. 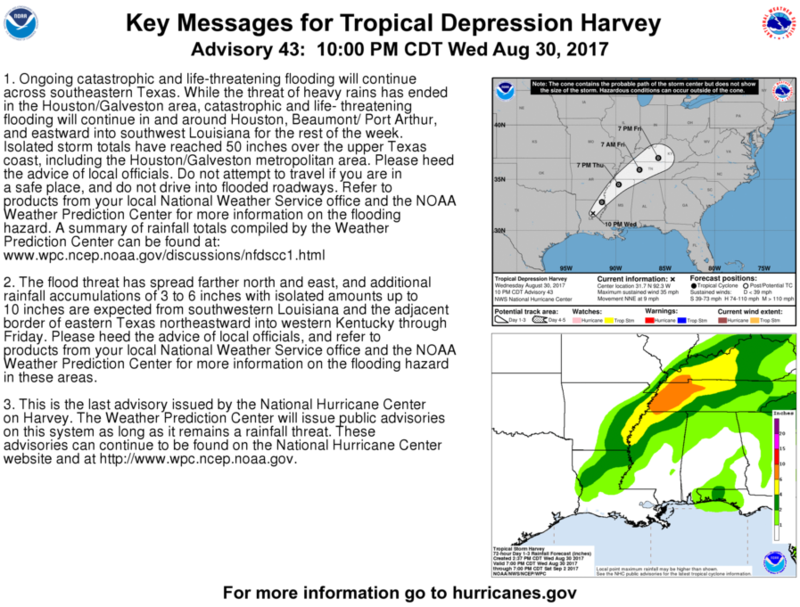 The Weather Prediction Center is issuing advisories on now Post-Tropical Cyclone Harvey has he continues to produce heavy rainfall and severe weather into parts of the Ohio Valley and Southeast US. You can find these advisories off the main menu of the voipwxnet web site, via the voipwxnet Facebook/Twitter feeds and at the NHC web site at http://www.nhc.noaa.gov as well. The VoIP Hurricane Net Management team’s thoughts and prayers are with the many folks in Southeast Texas affected by Hurricane Harvey both from the direct landfall of Harvey and the catastrophic heavy rainfall that followed. The VoIP Hurricane Net Management Team will continue to closely monitor Hurricane Irma and any other development in the tropics. Thanks to all for their continued support of the VoIP Hurricane Net! The VoIP Hurricane Net secured on Saturday 8/26/17 at 230 PM EDT/1830 UTC as Hurricane Harvey was downgraded to Tropical Storm Harvey. Harvey is currently stationary and while he is a tropical storm now, he will continue to bring very heavy rainfall and significant to potentially catastrophic flooding and strong to damaging winds with a threat of isolated tornadoes. Local and regional SKYWARN groups across Texas and possibly into Southwest Louisiana should remain active providing reports via the SKYWARN reporting criteria to support providing situational awareness and disaster intelligence to local and state emergency management, non-governmental organizations and other groups. At this time, Harvey is expected to remain over land and continue to weaken but maintain tropical storm strength for a prolonged period. Harvey is not expected to move much which is the reason for the significant concerns regarding heavy rainfall and catastrophic flooding. The slow movement of Harvey means that weather models will struggle to resolve his exact track. If Harvey were to reemerge over the water, that may allow it to maintain tropical storm strength longer. At this time, Harvey is not expected to reemerge fast enough or be close enough to the water to reintensify into a hurricane but given the slow movement and model uncertainty, this will bear close monitoring. The VoIP Hurricane Net management team will closely monitor the progress of Harvey and will maintain an informal listening watch on the *WX_TALK* Echolink conference node: 7203/IRLP 9219 reflector system over the course of the weekend and remains open for use by any local or regional SKYWARN groups in the affected area of Harvey. The VoIP Hurricane Net Management team also wishes to thank all involved with the net activation from the stations in the affected area who gave the net reports, the net controls who ran the net and researched other resources for information and data from the affected area for relay to WX4NHC, the Amateur Radio Station at the National Hurricane Center, to the owners of the listen only Echolink conferences and IRLP reflectors and Youtube livestream for all their help and support during this VoIP Hurricane Net activation for Harvey. A few sample audio clips from the net activation will be provided later today or Sunday Morning. An after action report will likely follow in a week or two. Finally, a reminder that due to the VoIP Hurricane Net activation for Harvey, the weekly VoIP Hurricane Prep Net for this Saturday Evening has been cancelled. Barring another hurricane net activation near or during the weekend, the weekly net will resume Saturday September 2nd, 2017. The VoIP Hurricane Net will activate for Hurricane Harvey no later than 2 PM EDT/1800 UTC Friday Afternoon 8/25/17 and WX4NHC, the Amateur Radio Station at the National Hurricane Center, will activate at 500 PM EDT/2100 UTC Friday Afternoon 8/25/17. Hurricane Harvey is expected to intensify to major hurricane status on Friday. The VoIP Hurricane Net for Harvey could be a very prolonged activation because once Harvey makes landfall, he may parallel the coast and maintain much of his circulation over the ocean creating the potential for a long duration activation with significant impact to life and property particularly for the Gulf coast of Texas but possibly Louisiana as we look into next week. Stations outside the affected area who would like to listen into the VoIP Hurricane Net can use any of the following systems for listen-only purposes on All-Star by dialing *033270177 or *033009123. Also, a reminder that the VoIP Hurricane Prep Net, held weekly during the hurricane season months of June through November on Saturday Evenings will be cancelled on Saturday August 26th, 2017 due to the Hurricane Harvey Hurricane Net activation. The VoIP Hurricane Net Management team continues to closely watch Hurricane Harvey. Thanks to all for their continued support of the VoIP Hurricane Net! The VoIP Hurricane Prep Net for Saturday Evening 8/26/17 at 800 PM EDT is cancelled. Hurricane Harvey will prompt a net activation Friday Afternoon into at least Saturday Afternoon if not into Saturday Evening and possibly even into Sunday. Given the resources required to support the net activation and the potential use of the system, the VoIP Hurricane Prep Net for Saturday 8/26/17 is cancelled. Hurricane Harvey net activation details will be posted a bit later this evening. Thanks to all for their continued support of the VoIP Hurricane Net! Harvey regenerated over the Bay of Campeche Thursday Morning and has been intensifying steadily overnight with maximum sustained winds of 60 MPH as of the 800 AM EDT Thursday 8/24/17 National Hurricane Center (NHC) advisory. A Hurricane Warning is in effect from Port Mansfield to Matagorda Texas. A Storm Surge Warning is in effect for Port Mansfield to San Luis Pass Texas. A Hurricane Watch and Tropical Storm Warning is in effect from south of Port Mansfield Texas to the mouth of the Rio Grande. A Storm Surge Watch is in effect from south of Port Mansfield Texas to the mouth of the Rio Grande and north of San Luis Pass to High Island Texas. A Tropical Storm Warning is in effect from north of Matagorda to High Island Texas. A Tropical Storm Watch is in effect from south of the mouth of the Rio Grande to Boca de Catan Mexico. The VoIP Hurricane Net will likely activate for Harvey in the late afternoon Friday lasting through early Saturday Afternoon. Any Amateur Radio Operators in the affected area of Harvey or with relays into the affected area of Harvey are asked to provide surface and damage reports into the VoIP Hurricane Net. Any SKYWARN Nets active in the local area that can pass reports to the VoIP Hurricane Net for relay into WX4NHC, the Amateur Radio Station at the National Hurricane Center are welcome to send a net liaison or connect directly at their discretion. We appreciate any and all support from Amateur Operators in the affected area or Amateur Operators with relays into the affected area. The VoIP Hurricane Net Management Team will closely monitor the progress of Harvey. Thanks to all for their continued support of the VoIP Hurricane Net! Given the offshore track, VoIP Hurricane Net activation for this system is not expected. Nonetheless, the VoIP Hurricane Net management team will closely monitor the progress of this system and other systems in the tropics as they develop. Thanks to all for their continued support of the VoIP Hurricane Net! Hurricane Franklin made landfall as a category-1 hurricane near Lechuguillas Mexico at approximately 200 AM EDT/100 AM CDT/0600 UTC. The VoIP Hurricane Net was informally active from roughly 800 AM EDT Wednesday through 200 AM EDT Thursday Morning. We wish to thank Carlos-XE2WCG for his help and support during this hurricane. We would also like to acknowledge that Hurricane Watch Net Manager Bobby Graves-KB5HAV was also monitoring the *WX_TALK* Echolink conference node: 7203/IRLP 9219 network and got a chance to talk with XE2WCG-Carlos as they had worked together in the past in the early 2000s on hurricanes. I’d also like to thank W9LW-Jay Farlow who came up on the network to monitor and to K3WRY-Joe Palsa for his offer to assist on short notice for NCO duties. We are entering the more active portion of the Atlantic Hurricane Season. The VoIP Hurricane Net Management team will be monitoring the progress of any potential systems throughout the season. Thanks to all for their continued support of the VoIP Hurricane Net! The VoIP Hurricane Net will be informally active through landfall of Franklin in Mexico into the overnight hours. Any stations in the affected area of Franklin or with relays into the affected area of Hurricane Franklin are asked to come up on the network on the *WX_TALK* Echolink conference node: 7203/IRLP 9219 reflector system. Thanks to all for their continued support of the VoIP Hurricane Net!